BART Strike Hits Commuters; No Word On Service Resumption : The Two-Way Monday's strike bogged down commuters in the San Francisco area. Member station KQED says some 200,000 people looked for alternative ways to get to work. 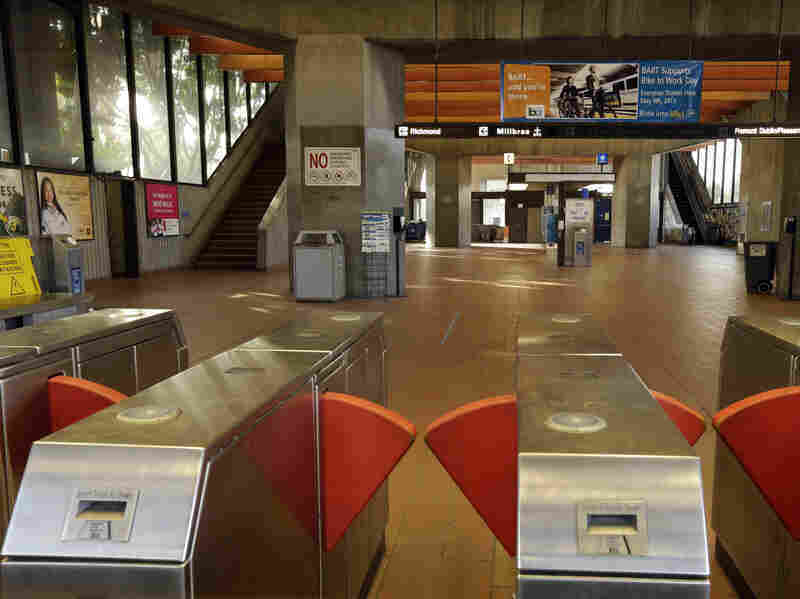 The Fruitvale BART station is closed Monday due to a strike in Oakland, Calif. Negotiations between unions and management broke off late Sunday despite the request of California Gov. Jerry Brown in a last-ditch effort to reach a deal. It's unclear Monday when the first strike in 16 years on the Bay Area Rapid Transit system may end, after BART said in a statement that it wasn't sure when talks with striking workers will resume. Monday's strike bogged down commuters in the San Francisco area. Member station KQED, which is live-blogging the strike, says some 200,000 people looked for alternative ways to get to work. Here's more: "Today's strike came after the contract with two of BART's unions expired at midnight without a new deal in place." "Clearly BART management never intended to negotiate a contract with us fairly and squarely," said Josie Mooney, of SEIU Local 1021 "They have created a terrible situation for the riding public and for our members." BART said the unions walked away from the table after reaching tentative deals on 11 items. The system carries 400,000 riders on an average weekday. Many riders started their commute early. The San Francisco Chronicle said the Bay Bridge was "backed up into the MacArthur Maze at 6 a.m."
"Many BART riders rode charter buses provided by the transit agency at the Fremont, Walnut Creek, El Cerrito del Norte and Dublin/Pleasanton stations. The buses took them to the West Oakland BART Station, where they got onto other buses for the trip across the bay." KQED and KALW are both reporting on the strike and its implications for commuters.